After achieving fluency in English, get ready for a new challenge: mastering the pronunciation. After practicing all the skills (speaking, listening, writing and reading) during the English learning process, you have achieved your goal of becoming fluent. You are able to communicate and easily understand everything you listen and read. But, may there be anything else to learn? Maybe the correct pronunciation of the words. First of all, it’s important for you to know that speaking skills and pronunciation are two different things; and that it’s normal to have some difficulties when trying to master these skills. Don’t give up, improving your pronunciation isn’t as hard as it seems at first. 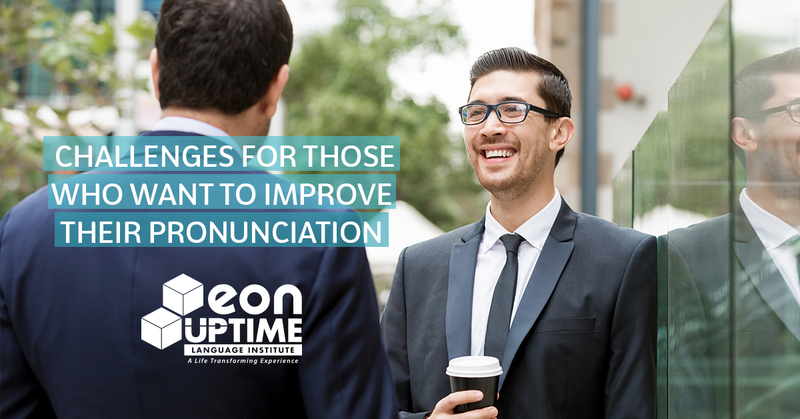 In this post, we will discuss the main difficulties for those who want to improve their pronunciation in English, and how to overcome them. All of these habits, when done with the intention of practicing speaking skills, which requires attention, are useful to help you put into practice what you have learned, since it’s natural that our brains reproduce what we listen through our speech (which happens when we learn how to speak our native language, for example). But we can’t always reproduce what we hear in the correct way. For this reason, for practicing pronunciation, you have to be even more careful: speaking something that sounds like what we think is right is not always the best way. Some alternatives are: watching videos, movies and series, as we have mentioned, and pay attention to the details in the way the characters speak. Sometimes, even the way you position your mouth affects your pronunciation. The fact that you have an accent from your home country doesn’t mean that your pronunciation is wrong. However, the pronunciation of certain sentences may, indeed, be a challenge. Have you ever noticed that people from different parts of your country pronounce the words in your native language in different ways? All of them are correct. The same happens in English, once the native speakers also have regional accents – there are differences between states in the USA and in other English speaking countries, like England. There are also accent differences between nationalities that have English as a second language, like Indians, for example. Don’t worry about this detail! Getting rid of your accent shouldn’t be your greatest goal, unless it’s a necessity. However, a few bad habits should be worked on, in order to achieve a correct pronunciation. The “th” in the English language should always be pronounced with your tongue between your teeth. The phonetics of some (or many) letters in English are different from other languages. Besides that, a few letters, when they are placed together in words, are also pronounced in completely different ways from what we are used to in our native languages. Let’s come back to the “th” example. The link between these letters makes a really difficult sound for foreigners to pronounce. Another example is the letter ‘W’, which in English sounds like a ‘u’ if it’s the first letter of the word. It’s important to have the feedback from a native speaker or a good English instructor. Only they can tell you if, in fact, your pronunciation is good or if you should work on some aspects. Just like any skill, to improve your pronunciation in English you need to have regular daily practice. Besides that, having a purpose in your practice may also help: when you know what you are practicing, with the goal of mastering that skill, it’s natural that the process becomes more efficient. In the meantime, how about watching a few channels in English on YouTube? By watching videos you can notice how the people speak each word in a clearer way than just by listening.